1) How did you start Lu-Ma, what was your purpose with it when you embarked on this journey? My daughter and I both did the two-week intensive and trained macrobiotically with Bill Tara and Marlene Watson-Tara. When we came back, both very inspired, I think within a month I really re-evaluated everything that I ate. 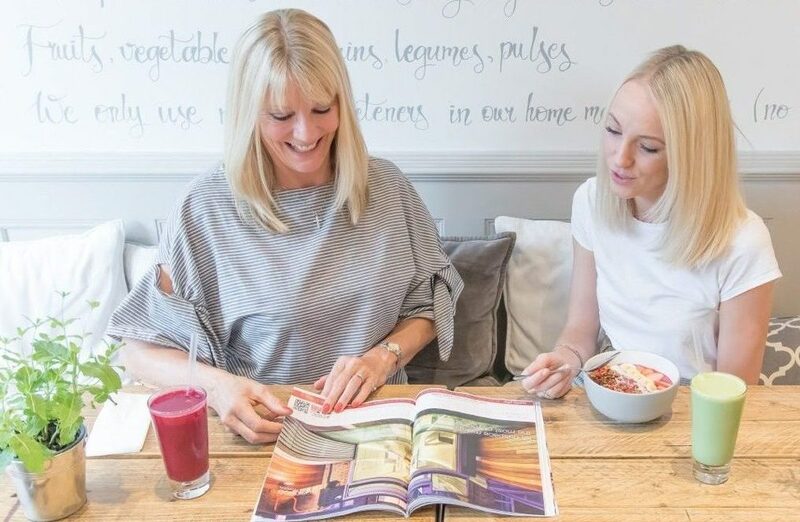 After realising how much better I felt following the course and changing my diet, I was chatting with my daughter and we both thought it would be great to open something that met the same values as what we had trained in. We thought let’s open a wholefood cafe with macrobiotic principles at the backend of that. One of our intentions was also to be a bit more of an educational hub, but we also work to be inclusive. We have proteins of salmon and eggs and vegan options of tofu, tempeh etc. We recently added a seitan dish (contains gluten) other than this, our menu is dairy free, gluten free and refined sugar free. Both my daughter and I began our health journey, we both saw massive improvement. Our training was over ten years ago and apart from one injection on my knees a couple of years ago, I haven’t had any other medical intervention. I still play tennis 2-3 times a week and do my gym classes, I am not going to say they are better, but they are not worse and that was what I wanted to avoid. 2) What were the benefits you saw of changing your diet and lifestyle? I have seen a massive change in my health, I have a lot more life energy since I’ve changed my diet. I actually don’t eat meat at all now and that is merely a choice, I have no problems with people that eat meat, it’s my personal preference. Same with dairy, I am not so strict with it but I know that if I do have it, I will know the next day that I’ve had it because I’ll feel some congestion in my body. We find sugar is great to have taken out of the diet, I will have the occasional coconut sugar. I’ve got quite a sweet tooth so, it’s nice to have found a substitute for that, that’s a little healthier. 3) What health and environment-related values and actions surround Lu-Ma? It is really nice to give healthier options to our customers that come in and to give them that information. For example, reducing your salt intake, we have gomashio, it is here, and it tastes good. That’s the same with coconut sugar, you have that rather than refined sugars etc. It is really nice to have the conservations with people and to have that influence. We constantly work towards looking after the environment, we really want to be holistic in every sense. Our packaging is mainly from VegWare. We shop as local as we can, that’s not always so easy. But when we do shop from a distance, we make sure we know where it is all being sourced and that it is all ethical. For example our eggs come from a company called Farmaround. The company house hens have completed their mechanical life of producing eggs, (and then they got rid of) so that they can continue producing naturally. We are trying to be a little bit more conscious, we try in different ways to introduce different product ranges, we work with people that are smaller rather than bigger. It is quite nice to support all of that with for example our juices, juices are all in plastic bottles and we’ve asked the suppliers if we can get them in glass so that is something they are researching into now. We use mainly organic produce and it is the best that we can get that we know of. Making sure that we can give the best that we can give to the people that come here and eat. 4) How would you define your menu? Our menu I would say is definitely nutritious and meets all the needs. We sit as a team and we discuss all of the menu and we make sure that we’ve got all of the nutritional content in that. We have our chef Angela who I think is one of the most amazing chefs that can make anything out of anything which is great for us. We also have a naturopathic nutritionist Kenneth Prange who is Angela’s husband, he will look over the menu and discuss points. He also comes to Lu-Ma and delivers free talks on various projects I.e probiotics, prebiotics, weight loss or good health. 5) What other things does Lu-Ma offer? The detox packages are new, there is an optional 3-day, 7-day, 10-day and 14-day packages that have got a lot of nutritional balance. We offer cookery classes for people which can be one-to-one or group cooking lessons. More information about these classes can be found on our website. Our chef Angela is always very happy to go to someone’s house if that is what they want as well. We do gift vouchers which makes it easier for people to buy a gift for somebody. My husband and I hold meditation groups, we do meditation evenings in Lu-Ma which is open to everyone. We do weekend workshops 3 times a year. We also support a 6-day residential course in Scotland (www.penninghame.org). So, we all work on our our own personal development and we would like to incorporate the things that we do into our work space. 6) What would be an advice you would give to someone who wanted to make some changes or try and be a little more healthier? I definitely had lots of encouragement from people around me, obviously to go for surgical procedures is not the best option. I think if the opportunities are good and there for you, it’s always good to look at what options you can take. For me it was definitely very much about looking at my diet, and as the cliché says ‘you are what you eat’. I found that to be really true for me. I am inspired when people come in and they start to see differences in their life from eating here with us. We have a few people who are going through their own illnesses and we often will sit and talk with them and find out what their needs are, what they want to eat, it is an ideal place for people to come when they are receiving treatments, because they want to start nourishing their body. To nourish the body is really going to aid the whole recovery, the treatment process, it is going to really support all of that because it is clean food. You are not putting things in that could really put a strain on your digestive system, on your energy levels, you are boosting those up. I think for anybody, if you have an opportunity to look at your lifestyle, and that is everything from your food, the way you live, how you live, it is a holistic approach, it is far better to do that earlier rather than later and support your whole wellbeing. 7) Is there anything you would like to add? What I should add to all of this is, for a number of years, quite a few of my family members have been seeing a complimentary doctor who is a qualified nutritionist and for most of them, they have been advised: To eat tiny amounts of meat, no dairy, no refined sugars, stay away from gluten. I think the same as a lot of people today need to test where they are, if there is a glutens intolerance, if there’s problems going on for them. All of my family eat here and feel really supported by that. The words vegan, vegetarian, wholefood, macrobiotic are not to be afraid of, it is an experiential thing, come in and try. It is really worth supporting yourself. Even if this is every now and again. It’s amazing how the body can feel cleansed and detoxed, contributing to your overall well-being, feeding your body with delicious, nutritious wholefood.